When I first encountered the concept of peak oil, I was most distressed about the economic implications. In part, this was prompted by David Goodstein’s book Out of Gas, which highlighted the potential for global panic in reaction to peak oil—making the gas lines associated with the temporary oil shocks of 1973 and 1979 look like warm-up acts. Because I knew Professor Goodstein personally, and held him in high regard as a solid physicist, I took his message seriously. Extrapolating his vision of a global reaction to peak oil, I imagined that the prospect of a decades-long decline in available energy—while we strained to institute a replacement infrastructure—would destroy confidence in short-term economic growth, thus destroying investment and crashing markets. The market relies on investor confidence—which, in some sense, makes it a con job, since “con” is short for confidence. If that confidence is shattered on a global scale, what happens next? I still consider economic panic to be a distinctly possible eventuality, but psychology can be hard to predict. Market optimists would see the tremendous investment potential of a new energy infrastructure as an antidote against such an outbreak. Given this uncertainty, let’s shy away from economic prognostication and look at a purely physical dimension to the problem—namely, the Energy Trap. Our goal will be to quantitatively assess the Energy Trap, and see if there is any substance to the idea. We will rely on a concept that has acquired a central role in evaluating our energy future. 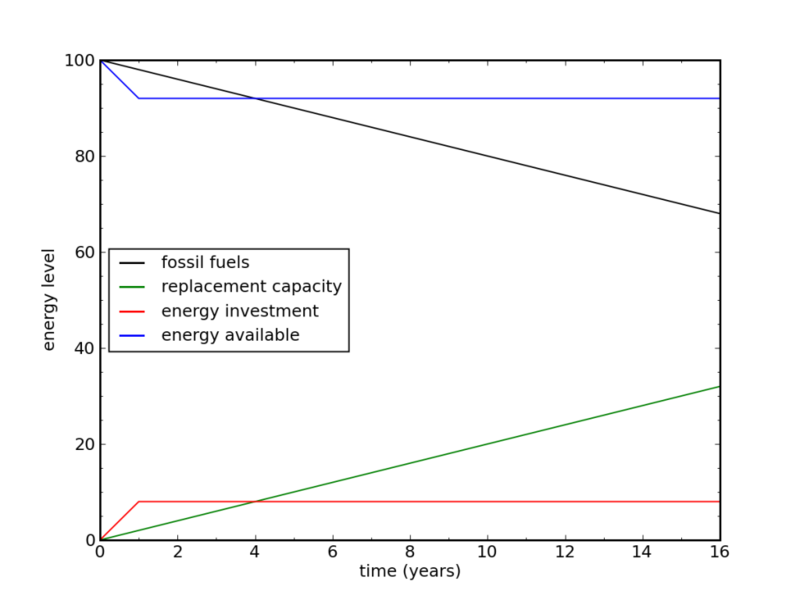 This is energy return on energy invested, or EROEI. In order to utilize energy, we must exert some energy to secure the source and prepare it for use. In order to burn wood in our fireplace, we (or someone) must chop down a tree, cut it into logs, and split the large logs. To drive our gasoline-powered car, we must expend energy finding the oil, drilling and possibly pumping the oil, then refining and distributing the gasoline. To collect solar energy, we must invest energy to fabricate the solar panels and associated electronics. The result is expressed as a ratio of energy-out:energy-in. Anything less than the break-even ratio of 1:1 means that the source provides no net energy (a drain, in fact), and is not worth pursuing for energy purposes—unless the form/convenience of that specific energy is otherwise unavailable. In its early days, oil frequently yielded an EROEI in excess of 100:1, meaning that 1% or less of the energy contained in a barrel of oil had to be expended to deliver that barrel of oil. Not a bad bargain. Oil production today more typically has an EROEI around 20:1, while tar sands and oil shale tend to be about 5:1 and 3:1, respectively. By contrast, it is debatable whether corn ethanol exceeds break-even: it may optimistically be as high as 1.4:1. Switching from conventional oil to corn ethanol would be like switching from a diet of bacon, eggs, and butter to a desperate survival diet of shoe leather and tree bark. Other approaches to biofuels, like sugar cane ethanol, can have EROEI as high as 8:1. To round out the introduction, coal typically has an EROEI around 50–85:1, and natural gas tends to come in around 20–40:1, though falling below the lower end of this range as the easy fields are depleted. Meanwhile, solar photovoltaics are estimated to require 3–4 years’ worth of energy output to fabricate, including the frames and associated electronics systems. Assuming a 30–40 year lifetime, this translates into an EROEI around 10:1. Wind is estimated to have EROEI around 20:1, and new nuclear installations are expected to come in at approximately 15:1. These are all positive net-energy approaches, which is the good news. Let’s explore what happens as we try to compensate for an energy decline with an alternative resource having modest EROEI. On the upslope of our fossil fuel bonanza, we saw a characteristic annual growth rate of around 3% per year. The asymmetric Seneca Effect notwithstanding, a logistic evolution of the resource would result in a symmetric rate of contraction on the downslope: 3% per year. I borrow a graphic from the post on the meaning of “sustainable” to illustrate the rationale for expecting an era of decline for a one-time finite resource. We could use any number for the decline rate in our analysis, but I’ll actually soften the effect to a 2% annual decline to illustrate that we run into problems even at a modest rate of decline. By itself, a 2% decline year after year—while sounding mild—would send our growth-based economy into a tailspin. As detailed in a previous post, across-the-board efficiency improvements cannot tread water against a rate as high as 2% per year. As we’ll see next, the Energy Trap just makes things worse. then we need an up-front energy investment amounting to 4 year’s worth of the new source’s output energy. 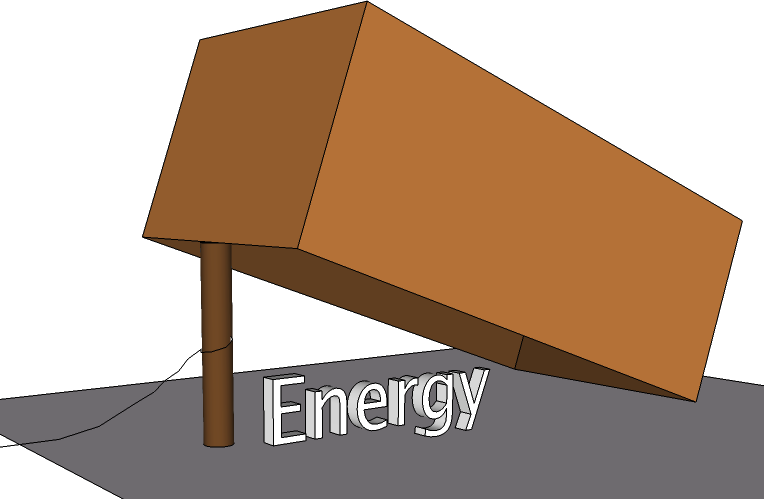 Since we require an output of 2 units of energy to fill the gap, we will need 8 units of energy to bring the resource into use. Of the 100 units of total energy resource in place in year one, only 92 are available for use—looking suddenly like an 8% decline. If we sit on our hands and do not launch a replacement infrastructure, we would have 98 units available for use next year. It’s still a decline, but a 2% decline is more palatable than an effective 8% decline. Since each subsequent year expects a similar fossil fuel decline, the game repeats. Where is the incentive to launch a new infrastructure? This is why I call it a trap. We need to exacerbate the sacrifice for a prolonged period in order to come out on top in the end. The figure above shows what this looks like graphically, given a linear fossil fuel decline of 2 units per year. The deployment steps up immediately to plug the gap by providing an additional 2 units of replacement each year, at an annual cost of 8 units. While the combination of fossil fuels and replacement resource always adds to 100 units in this scheme, the ongoing up-front cost of new infrastructure produces a constant drain on the system. In terms of accumulated energy lost, it takes 7 years before the energy sacrifice associated with replacement starts to be less than that of just following the fossil fuel slide with no attempt at replacement. This timescale is beyond the typical horizon of elected politicians. Another aspect of the trap is that we cannot build our way out of the problem. If we tried to outsmart the trap by building an 8-unit replacement in year one, it would require 32 units to produce and only dig a deeper hole. The essential point is that up-front infrastructure energy costs mean that one step forward results in four steps back, given EROEI around 10:1 and up-front investment for a 40 year lifetime. Nature does not provide an energy financing scheme. You can’t build a windmill on promised energy. We can mess with the numbers to get different results. If only half the total energy invested is up-front, and the rest is distributed across the life of the resource (mining and enriching uranium, for instance), then we take a 4% hit instead of 8%. Likewise, a 40-year windmill at 20:1 EROEI and full up-front investment will require 2 years of its 2-unit gap-filling contribution to install, amounting to an energy cost of 4 units and therefore a 4% hit. It’s still bigger than the do-nothing 2%, which, remember, is already a source of pain. Anyone want to double the pain? Anyone? Elect me, and that’s what we’ll do. Any takers? No? Wimps. It is unrealistic to imagine that we could jump into a full-scale infrastructure replacement in one year. To set the scale, the U.S. uses about 3 TW of continuous power. A 1% drop corresponds to 30 GW of power. Our modest 2% replacement therefore would require the construction of about 60 new 1 GW power plants in a single year, or a rate of one per week! Worldwide, we quadruple this number. What capability have we demonstrated in the past? In 2010, global production of solar photovoltaics was 15 GW, which is only about 6% of what we would need to fill a world-wide energy gap of 2% per year. Even on a tear of 50% increase per year, it would take 7 years to get to the required rate. Wind installations in 2010 totaled 37 GW, or 14% of the 2% global requirement. It would take 5 years at a breakneck 50% per year rate of increase to get there. When France decided to go big on nuclear, they built 56 reactors in 15 years. In doing so, they replaced 80% of their electricity consumption, which translates to about 30% of their total energy use. So this puts them at about 2% per year in energy replacement. I am being cavalier about comparing the thermal energy in fossil fuels to electricity delivered (factor of 3 in heat engine), but I more-than-compensate by not incorporating the large intermittency factor for wind and solar (factor of 4–5). For nuclear, expressing the replacement in terms of displaced fossil fuel makes for fair play. But in the end, this point only addresses realistic rates of infrastructure addition, and does not bear on the general Energy Trap phenomenon. Let’s imagine a more realistic trajectory for the replacement effort. In our scenario, the world faces a huge crisis, so we could perhaps outperform France’s impressive nuclear push and ultimately replace energy infrastructure at a rate of 4% per year. But it takes time to get there. If it takes 10 years to ramp up to full speed, we have the situation seen in the following graph. The energy investment still forces us to steepen the decline, initially looking like a 3.2% rather than a 2% decline. But it’s not as jarring as a sudden 8% drop. On the other hand, we fall farther before pulling out, bottoming out at >14% total drop around years 8–9. It takes more than 10 years to make out better than the do-nothing approach in terms of net energy loss. A table corresponding to the plot appears below for those interested in poring over the numbers to figure out how this game is played. Note that anywhere along the path, a cessation of the replacement effort will bring instant relief. For example, at the beginning of year 6, having installed 6 units of replacement energy up to that point, abandoning the effort will see 88 units of fossil fuel plus the 6 units of replacement for a total of 94 units. This would be a considerable step up from the previous year’s 88 units of available energy, and an even larger apparent gain over the 86.8 units that would be available under a continuation of the crash program. Likewise, if one stopped the program at the end of ten years, the installed 22 units of replacement would complement the eleventh-year fossil fuel amount of 78 units to bring us back to a peachy 100 units—like nothing had ever happened, and far better than the 88 units that we would otherwise endure under a continuation of the program. But stopping renews the dangerous decline. The point is that there will always be a strong temptation to end the short-term pain for immediate relief. As mentioned before, the Energy Trap is a generic consequence of modest-EROEI sources requiring substantial up-front investment in energy. We would need the EROEI to be equal to the resource lifetime in order to have a null effect during the decline years, or better than this to ease the pain or allow growth. For a 40 year lifetime (e.g., power plant, solar panels, wind turbines), this means we would need 40:1 EROEI or better to avoid the trap. Our alternatives simply don’t measure up. Curses! For resources that do not require substantial up-front cost in the form of infrastructure, the trap does not apply. Fossil fuels tend to be of this sort. The energy required to deliver a barrel of oil or a ton of coal tends to be specific to the delivered unit, and is not dominated by up-front cost. It is similar for tar sands, which requires substantial energy to heat and process the sludge. Even at 5:1 EROEI, filling a 2-unit gap can be achieved by producing 2.5 units of output while losing 0.5 units to investment. Thus it is possible to maintain a steady energy supply. The fact that fossil fuels don’t trap us encourages us to stick with them. But being a finite resource, their attractiveness is the sound of the Siren, luring us to stay on the sinking ship. Or did the Sirens lure sailors from ships? Either way, fossil fuels are already compatible with our transportation fleet, strengthening the death-grip. Conversely, solar photovoltaics, solar thermal, wind, and nuclear, are all ways to make electricity, but these do not help us very much as a direct replacement of the first-to-fail fossil fuel: oil. This is a very serious point. As Bob Hirsch pointed out in the 2005 report commissioned by the Department of Energy, we face a liquid fuels problem in peak oil. As such, not one of the five immediately actionable crash-program mitigation strategies outlined in the report represented a departure from finite fossil fuels. The grip is tight, indeed. We must therefore compound the Energy Trap problem if we want to replace oil with any of the renewable sources listed above, because we need to add the energy investment associated with manufacturing a new fleet of electric vehicles of one form or another (plug-in hybrid qualifies). This can’t happen overnight, and will result in a prolonged transportation energy shortfall even greater in magnitude than depicted above. Many of us have great hopes for our energy future that involve a transition to a gleaming renewable energy infrastructure, but we need to realize that we face a serious bottleneck in its implementation. The up-front energy investment in renewable energy infrastructures has not been visible as a hurdle thus far, as we have had surplus energy to invest (and smartly, at that; if only we had started in earnest earlier!). Against a backdrop of energy decline—which I feel will be the only motivator strong enough to make us serious about a replacement path—we may find ourselves paralyzed by the Trap. In the parallel world of economics, an energy decline likely spells deep recession. The substantial financial investment needed to carry out an energy replacement crash program will be hard to scrape together in tough times, especially given that we are unlikely to converge on the “right” solution into which we sink our bucks. Politically, the Energy Trap is a killer. In my lifetime, I have not witnessed in our political system the adult behavior that would be needed to buckle down for a long-term goal involving short-term sacrifice. Or at least any brief bouts of such maturity have not been politically rewarded. I’m not blaming the politicians. We all scream for ice cream. Politicians simply cater to our demands. We tend to vote for the candidate who promises a bigger, better tomorrow—even if such a path is untenable. The only way out of the political trap is for a substantial fraction of our population to understand the dimensions of the problem: to understand that we’ve been spoiled by the surplus energy available through fossil fuels, and that we will have to make decade-level sacrifices to put ourselves on a new track. The only way to accomplish this is through sober education, which is what Do the Math is all about. It’s a trap! Spread the word! This entry was posted in Behavior, Energy, Energy Scale, Growth, Transportation and tagged economics, EROEI, models, sustainability, technofix by tmurphy. Bookmark the permalink. I’m wondering what the effect would be of adding integral fast or liquid thorium reactors to the mix, given that they won’t require mining anytime soon (there’s plenty of fuel sitting around already), and operate at atmospheric pressure (no giant containment dome or high-pressure steel). There’s a lot of current research on making liquid fuels from CO2. Near-term, starting with natural gas would be another option requiring less energy input. In any case, looking at EROI this way is definitely important for figuring out what solutions are workable. I love the idea of Integral Fast Reactors as it solves 2 problems. One is the generation of energy and the second is getting rid of current nuclear waste. Also, a way to get around the NIMBY problem is to install one reactor on a current site. Take down one of the MARK I or II reactors that is there and put up a new IFR. The new IFR can run on all the old “waste” that is already there on site. Also, my next car is going to be electric, probably Tesla S since I only need to go at most 100 miles in a day. Make the investment now before the world goes sideways. One way to alleviate our needs for energy is reduce consumption. A good example is cars. Example electric cars average 3-4 miles / kWh while on a bicycle, the same distance will cost you ~0.05 kWh. This means that driving a car makes you use 20x more energy for distances you could do by bike. Passive houses could also help a lot, especially when compared to the cosntructions I see around here in Maryland. I can’t afford a new passive house. However, it is somewhat inexpensive to store summer heat into the ground under a building. We’ve been blowing summer air through the basement with fans for years – no more frozen pipe problems, and a noticeable, though small dent in the heat bill. If you do this, use a dehumidifier! At present, the savings are being invested into a liquid circulation system to move summer attic heat into the ground under the basement. Costs are low, and the work is good for my body. I also mention backyard gardening – with present intensive methods much more can be grown than most people realize. Nice post. Thank you! In general your posts have been very informative and thought provoking. However, in this case I would like to point out that your assumptions about EROEI for nuclear apply only to current types of light water reactors. It has been known since the dawn of the nuclear age that with breeders you could go to crustal concentrations of Uranium or Thorium and have a very positive EROEI. The energy content of fertile stuff in typical rocks is hundreds of times more than the energy required in its mining. (For old results, find Alvin Weinbergs paper on this: Physics Today somewhere in 1959). Furthermore, thorium or uranium breeders will not (once they are running) require enrichment at all which improves EROEI. Breeders are not rocket science and can be employed once the political will is there. My personal favorite is the molten salt thorium breeder. This is really a political issue and not an existential issue for mankind..unless people want to make it that way. Thorium and uranium breeders would have the effect of removing some of the long-term energy investment, making them more front-heavy, like solar or wind. We still face the problem that if EROEI is less than the lifetime, there will be at least a one-year hit in energy, which is tough to stomach in a decline. Do you have numbers on the EROEI of liquid sodium thorium, etc.? Of course without any having been built, any numbers will be highly uncertain (and probably prone to optimism, given that the only people motivated enough to do the calculation are likely proponents trying to jump-start a program). I haven’t got a proper reference for you, but I blogged about this issue briefly. Unfortunately, blog is in finnish. (I am also a physicist, so your way of framing things feels very familiar to me.) I wasn’t able to find good data on how much energy mining consumes as a function of ore grade. Details matter a lot, since large fraction of worlds uranium comes as a by product of other minerals. So the energy consumption might have happened in any case. The same is true for thorium, since it occurs as a by product in rare earth mining. However, I used a detour of picking a mineral that is rarer than uranium and thorium and for which the energy consumption is know. Gold is mined at concentrations of around 1ppm while the fertile matter occurs at 10ppm levels (in a random rock).Mining gold consumes 143GJ/kg (http://www.eoearth.org/article/Gold_mining_and_sustainability%3A_A_critical_reflection), but 1 kg of fertile uranium material has an energy content more like 83TJ. So there is a factor of 600 right there if we use the golds energy consumption as our estimate for mining. Since golds concentration is much lower and we have no need to mine uranium and thorium at crustal concentrations you are bound to end up with EROEI much better than with fossils. Molten salt thorium reactors also need beryllium to get started and this is pretty rare (4-6ppm in an average rock? ), but I am sure it won’t change the balance in a way that makes a difference this physicist. Thanks for this info/analysis. The continuing fuel cost in mining/refining is not important to the energy trap; only the up front energy cost (cost of building the power plant and support facilities) contributes to the trap. Sure. on the other hand the material requirements of msrs are most likely smaller than those for light water reactors. Since they operate at normal pressure, material requirements can actually be much lower. Domestically we had the IFR prototype near production-ready before it was shut down in 1994. GE-Hitachi has a completed design that’s similar, and got approval to build a demonstration plant. The biggest constraint on fast reactors is the startup fuel, which comes from nuclear “waste” and decommissioned warheads. If we want to replace fossil fuels over the next several decades using fast reactors, we’d need to build a lot more light-water reactors too. There isn’t a trap if we start building replacement capacity before fossil fuel decline begins, is there? As long as we have surplus we have energy “capital” to invest, which Germany seems to be trying to do (they said they’ll be going 100% wind, solar and renewable by year 20xx). Or are we already in the decline? Right; do it on the upswing and no one feels the pain. Yeah, but that takes vision and planning. When have we seen that in our lifetimes from politicians/leaders. I tried to get my brother to toss a few PV on his roof for times when the power might go out, just to keep the fridge running and some other things. He has the money to do it, just not the will. Yeah, it’s quite saddening that even simple solutions that hurt noone are (almost?) impossible to apply. Humanity will as usually wake up when it’s too late. Looking at ways economic crisis is “solved”, energetic crisis will also be deepened with “solutions” thought by politicians. If you want to have AC power from PV always on standby you will need expensive battery storage, lots of it, plus an expensive inverter. So you want your brother-in-law to keep those expensive batteries always charged for those rare power outages, when an inexpensive propane generator could take care of the regrigerator, freezer, and some lights? For the sake of family harmony, it is better to pay for one’s expensive whims himself. Great post! Really explains the problem well. Keep it up! How much do these numbers help ‘the trap’? I think, by simplifying the analysis and leaving economics out of it, you may be missing a key piece of the puzzle. As petroleum reserves decline, their price will continue to rise. Wind and solar are both young technologies with lots of room for improvement; as such, their price is currently in decline and reasonably may be expected to continue to do so. As I understand, utility-scale PV is just about at price parity for electric generation with petroleum-based standby generators. If you’re a utility needing to expand capacity, your investors might get a better return on investment if you go solar today, depending on the particular circumstances. And anybody forecasting the 30-year typical life of a new power plant has to be looking at expected fuel costs. In that light, solar and wind shine quite brightly, indeed. Any chance there’s a simple way to add money to the calculation? If so, I think the fuller picture will give a better idea of the pace at which we’re likely to actually perform the transition (if we can even do it at all). I am happy that prices will make alternatives financially competitive with fossil fuels, but this does not change the energy trap phenomenon: an energy decline will be exacerbated by a large-scale investment in modest EROEI infrastructure. The point I’m trying to make is similar to the one gshegosh is driving towards. We’re still not on the downside of the petroleum curve, and we’re already shifting from petroleum to renewables — albeit at a rather sedate pace. But the economics is causing the pace to pick up. At the one ludicrous extreme, if we’ve got a half-century before fossil fuel peaks and if renewables get cheaper at an annual rate of 20%, it seems reasonable to suggest that the lower cost of renewables will long since have caused them to overwhelmingly dominate the market, making the energy trap nothing more than idle curiosity. At the other end of the scale, if fossil fuel has already peaked, then we’re already trapped. It seems to me that it should be possible to extrapolate from historical growth patterns in both demand and new (or replacement) production, combine that with projected prices for both fossil fuels and renewables, assume that power plant operators will tend to go with the cheapest dollar-per-watt at groundbreaking time, and from all that figure out what portion of our infrastructure will be using what type of source at various points on the fossil fuel production curve. 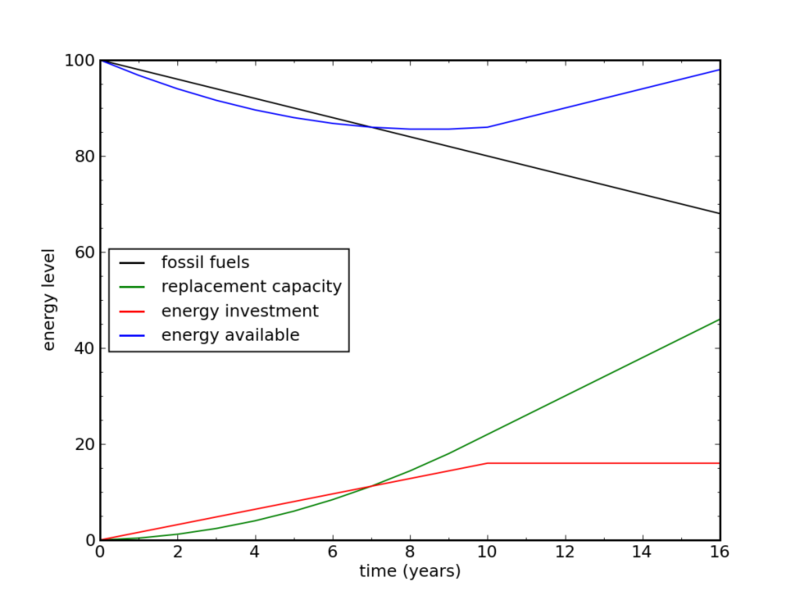 At some point, depending on the shapes of the various curves, the production from renewables will start to significantly reduce the demand for fossil fuels, further delaying or softening the collapse — there will be more fossil fuels still in the ground than if we weren’t making the shift, and people won’t be quite so eager to get to them. Will that be enough to avoid the trap? I haven’t a clue…that kind of math is beyond my pay grade…. Clearly the trap will be felt even more for economies in those stages of development…..
On the other hand, my understanding is that business investment rates in general are in the range of some 20%. Clearly most of those investments are not “energy-investments” per se, but they do have big implications for energy use, as they will reflect expectations of energy prices. I wonder if this will not partly mitigate the effect of the trap? I wonder if there’s any way to use the automatic retirement contributions to fund renewable power generation. I’ve been thinking that the automatic contributions into the stock market may just be continuing the transfer of wealth to the wealthy buy keeping stock prices inflated. (Money is being contributed without anyone really thinking if that’s an effective use of resources). To me, retirement funds actually represent a good use for funding renewable infrastructure build out. It’s fairy secure that a solar panel will produce X watts over its life span, and it doesn’t really matter that it will lose money for the first few years. The problem is getting institutions that are profiting from the current financial industry status quo to be willing to reallocate the resources. Electric cars and trains may help to supplement our energy budget – when gas becomes more expensive, low-energy transit methods (walking, bicycling) may become more and more necessary because of costs. That would indicate that there is a fair amount of “slack” in the system. Therefore, the “hand of the free market” should be able to price disposable goods that take a disproportionate amount of energy out of the market, making energy investments like building new solar, wind, or biofuels (such as 2nd gen algae-based biodiesel) a wiser investment for our dollars. Then there’s always nuclear fusion. Although they have achieved breakeven, its just not “economical” yet. “waste” is a bit problematic. The US, Canada, and Nordic countries use more energy per capita than many European countries. This in good part reflects climate differences: hot humid summers and cold winters call for more domestic energy use than mild climates. Not really *waste*. There’s work in building much more efficient homes — but there’ll be an upfront energy cost in adapting or rebuilding the housing stock, too. No idea what the effective EROEI would be. See the post on the limits to economic growth for a treatment of efficiency improvements. In summary, we might squeeze another factor of two at a typical rate of 1% per year. If the decline is several percent per year, efficiency will help, but not eliminate the basic problem. Interestingly, that is around the range of hydroelectric power, according to the results of my (admittedly lazy) Google search (http://mdsolar.blogspot.com/2008/01/eroie.html) and (http://www.theoildrum.com/node/3949) But I’m guessing that you didn’t include hydro because of its more finicky geographic requirements? Still, it’s a good trick if you can get it. I just got my regular supplier’s mix report from my electric company (required here in Maine), and hydro still tops the list, providing 29.6% of the electricity here. The good sites are plucked, and an all-out campaign on ever river and stream would be hard-pressed to even increase the share (currently about 7% for the nation) by even a factor of two. It’s a great resource when you can get it, but it does not provide much of a relief valve for expansion. Great post. It’s a good look at the large energy picture. It gives scale to the problems we face. However, liquid fuels peak, which you mentioned, may cause enough chaos and societal disruption that it will never be a “total energy” problem. For electricity, we could certainly build lots of dirty coal plants and rip the rest of the Appalachains down for the profitable 50-85:1 EROI, but we would still be up a polluted stream without a paddle when it comes to running our cars, trucks, trains, planes, boats, etc…. It is this scenario that is most overwhelming and will require very near term changes (hopefully in a peaceful manner). I won’t likely be driving a Thorium powered car any time soon. Maybe one offset with CdTe, if I could ever afford a plug-in hybrid. Liquid fuels can be synthesized in a variety of ways; it’s less a question of whether there’ll be fuels but how much they’ll cost. Essential uses like ships and planes and emergency vehicles will probably do okay, with trucks and cars facing competition from various forms of rail. I have written essentially the same article at http://www.peakoil.org.au/news/index.php?energy_profit.htm – “The energy dynamics of energy production”. It includes a spreadsheet for the PV model, http://www.peakoil.org.au/news/energy-profit.xls in which you can change the parameters for ERoEI, Lifetime and rate of growth, and see it reflected in the charts to get a better feel for what happens. Of special note is how much energy a PV panel (wind turbine, etc) produces in a year as a proportion of the energy it takes to make a panel, which works out to (ERoEI / Lifetime) , so any attempt to grow the industry at more than rate will require a permanent energy subsidy from something else. Your article mentions a later one including ongoing costs. If that is done, could you reference it here? Why overlook the simple fact that this planet we live on has a very hot molten core, and we can tap into that heat with current technology (drill, baby, drill, etc.). Half of all fossil fuel is ignited for heating buildings, not for creating motion. But beyond that, we have to completely redesign our lives and dispense with cornucopian fantasies, which have until now involved an socio-ecological disaster commonly known as “the private automobile”. There is no way to sustain that wasteful concept on low EROEI. Has anyone done the math and can say for how long Earth core thermal energy would last and what would be environmental consequences of massively using it? AFAIK magnetic field Earth has to protect us comes from the fact its core is liquid and moving. What happens if the core becomes solid and static? Geothermal heat flux is on the order of human energy use, and that’s including really diffuse flow, so it’s not really sustainable very long term. OTOH, the resources are large. A magma chamber of roughly 1 km3 is 3e12 kg. At 1 kJ/kg-C, and 1000 C, that’s a megajoule per kg, or 3e18 J, enough to power the whole world for about a day, not counting conversion inefficiency. Doesn’t sound like much, but that’s the world vs. one small magma chamber. A set of plutons on the scale of 1000 km long and 100 km wide and 10 km deep would provide power for a million days, or 3000 years. Tangentially, treating the small volcanic magma chamber as a gigawatt power plant, it would last 90 years, not counting replenishment or conversion. I suspect that we could actually tame vulcanism, though you’d really want to avoid blowouts like BP. Wouldn’t it cause a dramatic climate change if we used up core heat? 1. You said that the curve of fossil fuels is symmetrical, so FF will decline at 3% per year. However, the curve of any resource is not symmetrical, because the amount of extractable resource depends not just upon the amount in the ground but upon price. In every oil well, they leave the majority of the oil in the ground because it would be too expensive in terms of money (not energy) to extract any more. As prices increase, the amount of oil which can be profitably extracted increases, thereby re-opening old wells, and this greatly attenuates the rate of decline. As a result, we’ve seen large blocks of oil-producing nations that plateau for years or decline very gradually (1% or less), far slower than the initial rate of increase. 2. You say that FF as a whole have grown by 3% per year, and will peak and then decline at the same rate. However, you appear to be talking about oil here. In fact, there are 3 different kinds of FF (oil, gas, coal) which will peak at different times. Oil will reach its peak in 10 years or so, gas in 60 or so, and coal in 100 years or more. As oil is declining, coal and gas will still be increasing. If we drew a curve of all FF then the rate of decline is more like 1%, and this is assuming the curve is symmetrical which (as I pointed out in #1) will not be the case. 3. You are assuming that nuclear power has a lower EROI because of upfront energy costs. This is not the case. Almost all the energy investment for nuclear comes from energy-intensive enrichment of Uranium. Since enrichment is occurring continuously during the lifetime of the plant, the “upfront” energy investment is nowhere near what your 10:1 EROEI figure would suggest. Errr hate to tell you this, but Peak Oil was 2 or 3 years ago, and Peak Coal energy content (NOT tonnage) is predicted for 2015. It’s more fair to say that we’re on an oil plateau. We’ve bumped around at about 86 Mbpd since 2005, plus or minus a percent or so. It will be difficult to acknowledge a peak until we see decline at the same time prices/demand are high. But most predictions point to this scenario before 2020, including the U.S. Department of defense (http://www.fas.org/man/eprint/joe2010.pdf). Some years ago, a well known Spanish engineer I befriended on the ‘net told me that if the world wanted to generate just 20% of its electricity over ten years using wind turbines only, it would take twice the current global steel production, half the copper, all of the concrete, and a thirty fold (yes 3000%!) increase in fibreglass production. So I ask, what else would we do during this decade? We certainly couldn’t build any roads and bridges and cars, just for starters. Nor houses, schools and hospitals. Limits to Growth are here to stay, that’s one thing this great article has proven to me. your “well known” engineer friend you ran across on the net is off by two order of magnitude or more. 200 tons of steel per turbine yields 240M tones of steel needed. World steel output per year 1.3B tones or 13B tones over the given 10 year period. 240M/13B = 1.8% of world steel production needed by wind. much less than the 200% your buddy on the net claimed. I wont bother w/ the other resources you mention as common sense tells me they are not a concern. Well, this friend of mine, whose name is Pedro Prieto (Google him) was in charge of major wind and solar installations in Spain, and he KNOWS what goes into building turbines. “I invite you to calculate the raw materials and related energy cost for the mining, transportation, refining, performing of materials, assembly, transport, paving mountain ways, installing and maintaining 500 GW: take a Vestas or a Gamesa or a Nordex 2 MW typical wind generator: about 150 tons of steel; 30 tons of glass fibre; 3 to 5 tons of copper, 1,000 tons of concrete. And the machinery to transport, heavy tonnage cranes, to install, etc. And here’s an interesting interview he gave last year.. Some commentators seem to be missing the point of this piece. As I understand it, Tom’s point is that any form of new energy infrastructure which involves upfront investment is not going to happen, because the status quo is the only option with short term benefits. We’re not going to sacrifice the short term for the long term, ever. This is why thorium reactors are irrelevant. The upfront cost of setting them up may be attractively low, but the upfront cost of sticking with the fossil fuel status quo is even better – it is zero – and so we will stick with the fossil fuel status quo. Ditto improved solar. Ditto wind. Ditto more hydro. In fact, ditto everything. We will hold onto the status quo with a death grip until we have no energy left which we can afford. This is why Tom is right to leave economics out of the piece, because the economics do not change this. Let’s say, for sake of argument, that fossil fuel prices go up on the supply downslope. The prices will go up even more if we’re trying to use some of that fossil fuel to create a new renewable energy infrastructure. The result is huge energy prices, and society will be under immense pressure to get those prices down. What to do? The quickest win is – wait for it – abandon the renewable energy infratstructure. That will relieve some of the pressure on the FF prices, and everyone breathes a bit more. So that’s why renewables will not happen. If the price of FF resources rocket, then society will savagely cut everything else to pay those FF prices. Tom’s argument therefore still stands. Well, when the word we means to say ‘we Americans’…? I think there are political ‘moments’ where the short term rationale does not win. Although I’m very suspicious of the reasoning (or lack thereof) of the current German coalition in reversing its commitment to nuclear solutions, the will and ingenuity that’s on show here in Germany does inspire hope. One could/should also mention the aspirations of Portugal. They are making substantial changes to their infrastructure now. Mainly to facilitate the decentralized solar / wind parks they’re banking on. Although I would generally agree with the pessimistic assertion, I believe that scarcity (in Germany, that’d be space) also plays a role in changing prevailing behaviours. (btw., I’m an ex-pat Canadian ueberconsumer living in berlin). Neither Portugal nor Germany is currently in the energy trap. No one is in the energy trap, because fossil fuels haven’t started their overall decline yet. We’re still on the upslope, where countries can afford to do the whole renewable thing…. but when globally we’re all in the trap, Germany and Portugal and everyone else will pump all they have into fossil fuels, because that’s the only way to minimise the short term pain. Rich people will, since there will be high profits with low risk, and they can afford it. Hm, I’m not sure the “quickest win” works out that way. It’s not like the economy is centrally directed by someone making global decisions. Instead we have a bunch of individual actors pursuing their own selfish interests. Some of them will be investors with long time horizons, who will pay the money to invest in thorium or whatever, because they’ll see a big payoff down the road. They won’t care about the immediate effect of their investment on energy prices. Meanwhile there will be other people responding to higher prices by driving less and turning down the thermostat. In the short term, it’s more troublesome in aggregate to do that, than to simply refrain from building a thorium plant. But that doesn’t matter. People aren’t making decisions based on their aggregate effect. You forget that ~99% of all things produced are trash in 6 months. And there are important inefficiencies in the manufacturing process / logistics. Why do you need to change your ICrap every year? Why do you need to change your car every 3 years or so? Why are the things produced with intentional design flaws so that their expected life is at least 10 times shorter that it should be? Why is it impossible to fit new parts in older computers? The answer is simple: in the current economic system a company cannot survive if it doesn’t follow this model. No amount of regulation or whatever will ever change this. A new system is required…. At this particular time it seems to me the “We” as in “We could build…” are as averse to sacrificial investment as are the “They” as in “They’ll think of something.” The fact is we in the developed countries are not leaning forward and investing – or even planning for – the future. We are retrenching, economizing and enforcing austerity on the austere in order to cut taxes and preserve the past. As has been noted (with glee I’ll add) by those who do not believe in finite resources, we in the OECD are already reducing consumption. As energy costs continue to increase we’ll be forced to consume even less. So the baseline “energy level” — including the slack that could make transition less painful, is falling even as we do nothing. Which begs the question, who will invest in energy infrastructure in a shrinking energy market? One of the best descriptions of our predicament that I have read. Thank you. I suspect there is something buried in the physics of capturing solar flows (of one form or another) that guarantees EROEI is less than the resource lifetime. This is why I was a proponent of nuclear until I started to think about the dangers of nuclear being maintained by a civilization in decline. Perhaps Jack Alpert is correct and the only possible solution is rapid population decline. Surely, rather than replace an infrastructure as the first choice, isn’t it better to try to find an energy source which uses at least the bones of the existing infrastructure. The oil economy took two world wars and 50 years to build. Biofuels could be engineered to use the existing oil logistics, saving a fortune in energy spent on building new infrastructure. Now, biofuels from fresh crops are a dead end, for certain. We still need to feed the billions while we somehow reduce our human headcount with some sort of humanity and dignity. However, food crops are about 10% of the biomass they are harvested from, the rest is “farm waste” and is usually left to rot, producing methane. There are a number of processes emerging now which offer potential for the production of a crude oil substitute from farm waste. This isn’t about producing methanol, this is about converting cellulose via engineered organisms or soups of existing organisms into a raw material which can be fed to existing refineries and turned into everything from bunker oil, to petroleum for cars, even jet fuel. On such sunrise firm, Sustainable Power (Texas) claim the USA produces enough farm waste to support six times that country’s entire land transport energy needs. The benefits of using farm waste in this way include closing the carbon cycle (the methane from letting the waste rot is more greenhouse active than CO2), national energy self-sufficiency for any country using such a process, more income for vegetable crop farmers and less international dispute over finite oil reserves. (Which could lead to much less war.) The use of farm waste derived energy makes energy sustainability possible with only a small population reduction. Surely, this sort of solution would buy us the time needed to develop a closed-loop economy, to replace the current exponential economy, and to get population under control. Do you think this sort of solution presents an optimistic future and, if so, how do we get science, industry and government interested in making it happen? I think the lack of integration of economics writ larger into this analysis is a serious flaw. Replacement of infrastructure happens on its capitalization / lifetime time scales, not “all at once” except in extremis. Power plants rarely are built for less than 40 year lifetimes; alternative energy replacement timeframes would be equivalent. Encountering a situation where one was going to run out of or for external reasons (CO2 emissions limits, say) be forced to reduce use of a particular fuel needed for newer installed units may break that model. And there’s reason to be concerned that we’re approaching such a situation now. But the modeling for that, both on pure energy and economic fronts over mid-long timeframes (decades) is extremely complex and not well discussed in public (by any side). Different industries have different timescales; autos turn over in 10-15 year timescales (statistically, not every single unit); refineries on 50+ year timescales for some infrastructure, 10+ years for others; power transmission on 25-50 year timescales; oil drilling on 10-30 year timescales; hydrocarbon burning power generation typically 30-50 year timescales; nuclear plants 30-40 years, etc. Your mileage may vary (experts in each field will push estimates up or down or sideways; these are all gross simplifications) but bulk statistical methods can provide useful models and inform macroscale optimization. The best resource of all is the one lurking in every building…. efficiency. Reading thru this realistic scenario I feel that a nuclear war or a vast biological war would be cheaper and our politicians seem to prefer this approach…. very scary indeed.. The alternative is to learn to live with 10% or so of the fuel we used the year before, as a 10% decline in use per year per capita would provide a buffer..to the declining oil fuel supply and increasing population. Oil and nat.gas production will also coincide with water shortages, then food shortages and then we are probably back to my first option..Yuk! Also the countries that are now using much lower energy per capita would have an advantage economically and politically. If we take this writer at his word then we need to start today as the sooner we start the more advantageous it is compared to other countries, especially those with less resources for rapid production of vast solar fields or wind farms. On the good side the sun will eventually explode and provide plenty of energy for all. Oh, sorry there is nuclear fusion round the corner.. I personally advocate this strategy. I have shaved my household energy profile by a factor of 3–4, and still am a westerner by all appearances. We can ramp down and deal with less. The economy will not react well to such a plan, however. Over ~10 years… we shaved ours by 90%! We still have everything that opens and shuts… but no swimming pool. Thanks Tom for detailing the transition challenges. We found two general patterns in the relation of energy gains compared to energy costs: a gradual secular decrease in EROI and an inverse relation to drilling effort. EROI for finding oil and gas decreased exponentially from 1200:1 in 1919 to 5:1 in 2007. The EROI for production of the oil and gas industry was about 20:1 from 1919 to 1972, declined to about 8:1 in 1982 when peak drilling occurred, recovered to about 17:1 from 1986–2002 and declined sharply to about 11:1 in the mid to late 2000s. We provide a preliminary assessment of EROI for the world’s most important fuels, oil and gas, based on time series of global production and estimates of energy inputs derived from monetary expenditures for all publicly traded oil and gas companies and estimates of energy intensities of those expenditures. We estimate that EROI at the wellhead was roughly 26:1 in 1992, increased to 35:1 in 1999, and then decreased to 18:1 in 2006. These trends imply that global supplies of petroleum available to do economic work are considerably less than estimates of gross reserves and that EROI is declining over time and with increased annual drilling levels. Our global estimates of EROI have a pattern similar to, but somewhat higher than, the United States, which has better data on energy costs but a more depleted resource base. The major difference is that the global light oil production is near peak production, while the USA’s 48 state oil production peaked in 1970 and total oil is much farther past the peak and on the downward slope. i.e. most of the “easy” oil is gone. What is left requires more effort to recover. A Review of the Past and Current State of EROI Data, Ajay K. Gupta and Charles A.S. Hall, Sustainability 2011, 3, 1796-1809; doi:10.3390/su3101796 Oct 11, 2011. 1. I think you still need to consider the benefits of transformity between FF’s and electricity. You can substantially minimize impacts of the lower capacity factor of renewables by investing in a geographically disbursed set of renewable energy supplies connected through an geographically expanded power grid. Add energy storage and a diversity of types of renewable energy sources and the effective capacity factor of renewables is further enhanced. These are “energy-balancing” areas. 2. It would seem that if we redirected a significant percentage of consumption away from non-productive uses and toward building a replacement energy supply this would free up a lot of useful energy needed for this endeavor. As you point out, however, we should have done this 30 years ago. Thanks for the post. I think a post of this length and depth deserves a literature list. I’ll have a look especially at your EROI references. There’s a nice overview graph in Hall and Day 2009 (American Scientist), for example here http://www.buildinggreen.com/live/index.cfm/2011/1/11/Energy-Return-on-Investment. Please visit my energy presentation at http://www.slideshare.net/amenning/ and leave your comments and suggestions! I agree with Goren & Gshegosh that the economic dimension is too critical to ignore. As we are now beginning to see with oil, coal, and (soon I expect, despite forecast massive supply increases) gas, there is unlikely to be an abrupt peak and decline, but rather a plateau as easy to reach reserves are depleted and more difficult to access/environmentally damaging ones are tapped instead, albeit at increased cost. 1) Nuclear plants take several years from planning to commissioning, and enormous cost, before any return is seen. Only an entity with a planning horizon of around 30 years+ would ever build one. 2) Oil/Gas are not (anymore) a matter of just walking out and sinking a pipe into the ground. The survey, exploration, and development of a new resource takes years, is high risk, and requires a base of extremely expensive equipment. As for willingness to invest in new technologies, the massive acceleration of investment in wind and solar proves that energy generators ARE willing to make large, long term investments in renewable energy *if* the price is right. And that’s the key point – if the price is right. An extended plateau/drop in availability of conventional energy will drive up the price… which will make renewable plants more expensive to build, sure, but will also give them insane returns… hence there will be lots of investment. As a result, I’m not that worried about the prospect of an Energy Trap as you describe it (with overall availability of energy being the fundamental limiter) but rather that the sharply increasing cost of energy will drive societal instability (food gets too expensive, heat gets too expensive etc… to the extent that it’s not already so for most of the world). I guess the other problem that might occur at regional levels is that the changing economics prevent new investment – does the USA, for example, as a huge consumer of energy and running a massive balance of trade deficit, really have enough ‘money’ (either cash or energy/production potential) to accomplish this infrastructural shift? For now I’d say yes… and hope it stay that way… but there’s definitely a risk of some nations with less foresight being forced into new energy poverty. On the total cost of achieving the transition however – it’s doable. This doesn’t necessarily address the liquid fuels problem (though the progress there in electric vehicles gives me a lot of hope) but I think it’s a mistake to mix the two issues. Excellent points. Part of why I ignored the financial side is that I think it only makes things worse. In other words, if the impetus to invest in a new energy infrastructure is indeed energy scarcity (making conventional energy prices rise or even skyrocket), then the Energy Trap means that a significant infrastructure effort will only make energy more scarce. And that’s why prices went up to start with. The rising price of (conventional) energy it takes to fabricate the new resource will make the new resource more expensive too. 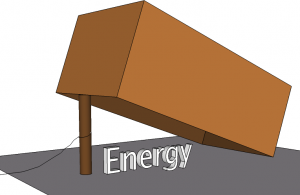 So the Energy Trap is paralleled by a financial trap of sorts. Embarking on a crash effort will make prices go up across the board, while backing off on the crash plan at any point will bring price relief by freeing up scarce energy. The incentives oppose wisdom. But geez, if China decides to use our $15T debt to build its infrastructure, we experience double pain. Not sure we could survive that one (surely we’d engage in war before we let it come to that, as is our way). More expensive relative to what? It seems that you haven’t figured the economics out quite yet. If the cost of conventional energy goes up due to declining supply, the economy will either use less energy to bring demand down to match supply, or new energy sources will be developed to bring the supply up. These new energy sources will be more expensive than the current ones, but they will only be developed to the extent that consumers are willing to pay the price. I don’t see how the EROI issue really changes that picture. The problem currently is not that energy is too expensive. On the contrary, it is too cheap. That is precisely why low EROI resources (like tar sands or corn ethanol, which have EROI close to 1) are even considered. If energy were more expensive, a lot more effort would go into conservation and the development of comparatively high EROI energy resources like wind. How can tar sands even be thought to be competitive with wind? Yes, I understand that if conventional energy prices skyrocket, the alternatives will become cheaper options relative to the conventional choices, even though they would be more expensive than they are today because the (energy) cost of manufacture has gone up. The energy trap turns up the knob on this phenomenon even more, by making conventional energy even more scarce than it would have been without a crash replacement program. I am reluctant to underestimate the impact a reduced energy diet will make on our economies. Dialing back demand to rein in the price is not as easy to do with energy as it is with iPhones, etc. I certainly don’t want to jump on the “market will gracefully solve this problem” train, because I see energy as the market lynch-pin (not just a traded commodity) so a failure on the energy front could produce widespread market failures in unexpected ways. Hmm, I see your point. I think the market will make it both worse and better. Better because at least there will be entities with a relatively long term planning horizon who have a big incentive to invest in clean (or at least ‘alternative’) energy sources… and who are large enough and stable enough that there’s a good chance they’ll be able to secure credit for such a venture (I doubt there are many entities that get lower interest rates than a big electric utility). Bad because, through their superior credit position and their willingness to invest/consume-short-term-energy, these same entities could well amplify the supply crisis (in exactly the way you describe) and force everyone else into energy poverty and wailing and gnashing of teeth and societal collapse and we all fall down. As you say, neither doing it slowly nor doing it quickly provides a solution to that problem. Do it slow and it takes to long to have the replacement capacity online. Do it fast and the short term poverty is worse. To sum it up: Investment in future capacity reduces our current capacity and the low EROI guarantees a further negative spiral. What we need is another 100:1 energy proposition but nothing appears to be capable of achieving this. So we are screwed, as suspected. A bit bleak 🙂 I think the point is that we can actually get away with quite low EROI so long as we start the transition while there’s still enough slack in the system… i.e. now. Which is happening at least, it’s now just a matter of continuing to build the rate of investment rather than allowing this ‘economic crisis’ bullsh*t to stall the whole thing… which interestingly enough is a perfect example of exactly the sort of market driven short term thinking (let’s stop the renewable subsidies, because I need a new iPod (read: tax relief) *TODAY*) that Tom’s collapse scenario is predicated on. Maybe I’m too optimistic. Though we’re still ok (for a certain value of ok) if the transition is as I describe above in the ‘good’ case… sadly we’re not there yet on the economics. Yes, pretty scary and I think it’s something that many of us subconsciously already realised – but hey, we don’t like focusing on all that negative stuff. The issue that’s not covered in this post is regarding reduction of our energy needs/wants. The amount of energy and resources we waste is surely the major problem and it’s basically a capitalist economics issue. We produce consumer goods that firstly: we probably don’t need and secondly: these goods are produced with inbuilt obsolescence. My parent’s generation bought things that were expected to last and certainly didn’t discard them because they were so ‘last year’. And all the time it gets worse. Who’d’ve thought that shopping would become a leisure activity? My question is: Who really needs a ‘blood phone’ (http://links.org.au/node/1828). I would hazard a guess that the larger percentage of our energy use is spent on producing [ed: junk] that we didn’t know we needed until the markets told us so. But getting past those problems is even harder to solve than the energy trap. In many ways, and to take a somewhat selfish stance, I’m glad I’m old. Great post. I checked the numbers from the first graph because I didn’t believe them, but they appear to be correct as far as they go. If you go on past year 40, you need to begin to replace the original alternative plants since they are past their lifetime. Since you are still replacing fossil fuels, this reduce the net energy available to 84 units until year 50 when all the fossil fuel is gone. Simplistic, yes, but realistic. If the replacement time is only 20 years, the problem gets even more serious. I initially looked at longer periods, and saw the drops associated with 40-year replacement (though depends on what you assume your maximum production rate to be). I also made all kinds of other rules, like energy targets that may be stable or grow with time, and rules about ramp-up, etc. The dynamics got out of control, but I didn’t want to emphasize the complexity of a simple model 40 years and more into the future. It’s interesting, and some effects are real enough to consider. But it’s in the short term that the Energy Trap has its biggest bite. Exceeds 2.9TW? You have stated previously that the US uses 3TW of continuous power. This sounds too good to be true.